In a nutshell, the Acer ED242QR Abidpx monitor can effortlessly be the perfect monitor for your gaming needs. It is designed and built keeping in mind the needs of a gamer. With such price and specs combination, one should not give a second thought before buying this product. It has a few minor drawbacks. However, the advantages are much note-worthy as compared to the drawbacks. From the Acer ED242QR Abidpx review, we would provide this monitor a rating of 3.5 on a scale of 5. With the increase in the number of computer games and players, the need for having the best gaming PC has also increased; be it professional gamers or leisure gaming gamers, they always like to have the best experience. With the increase in the expectations of the customers, the demand for gaming computer products has increased manifold in the past. With this, manufacturers are trying to provide exceptional products to the customers to grab the growing demand opportunities. Acer is one of the leading manufacturers of consumer electronics and technology products in the country. It has delivered some of the best gaming products in the past. Their gaming products are designed keeping in mind the crucial requirements of gamers. When it comes to gaming monitors, Acer’s monitors are really among the top gaming monitors in the market. 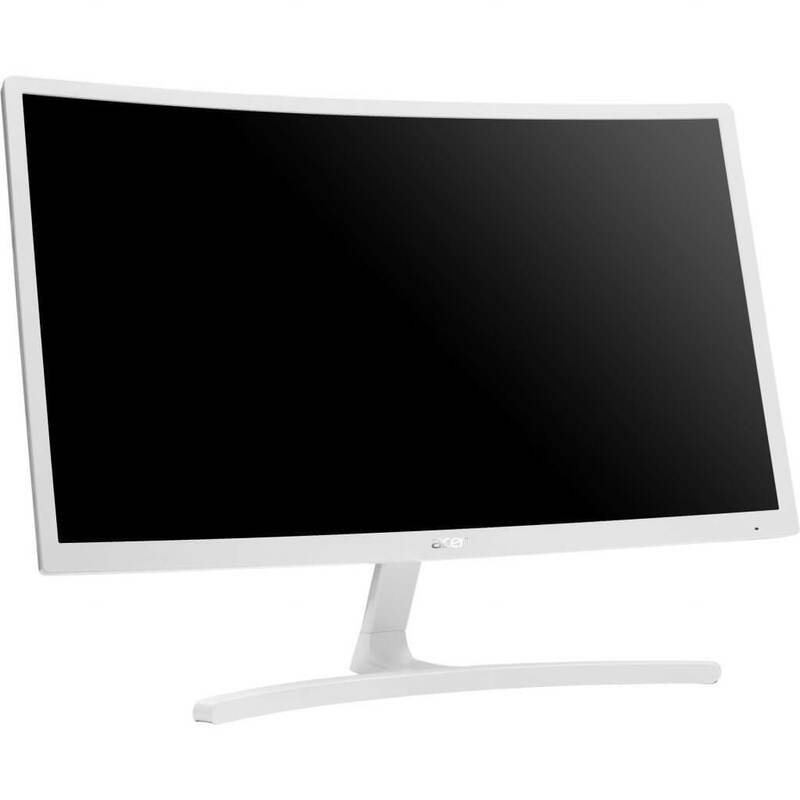 One such recent manufacture of the company is its curved gaming monitor Acer ED242QR. Soon after the launch of this gaming monitor, it surpassed all its competitors. It quickly bagged the status of being one of the best gaming monitors in the market. One essential requirement of a gamer is to have a wide-viewing monitor having good picture quality. This monitor serves both the purposes along with other great specs. In this article, we will provide our readers with a detailed Acer ED242QR review. It has a sleek and thin design. It reduces eyestrain and helps in long gaming engagement without any eye stress. It possesses a superb picture quality and allows you to adjust its color settings. It offers excellent performance and fast response time. The responsiveness of the monitor is super fast. The body of the product does not compromise with quality. The monitor does not come with inbuilt speakers. Many customers have complained about identifying issues of dead pixels. It is not much preferable for performing writing and reading tasks. Keeping in mind the salient features of the Acer ED242QR Abidpx monitor, we can say that this monitor can surely help you in fulfilling your gaming needs. If you are looking to invest in a good gaming monitor under $300, then this would not be a bad choice at all. However, to help you make an informed decision, we present you with a more detailed review of the product. 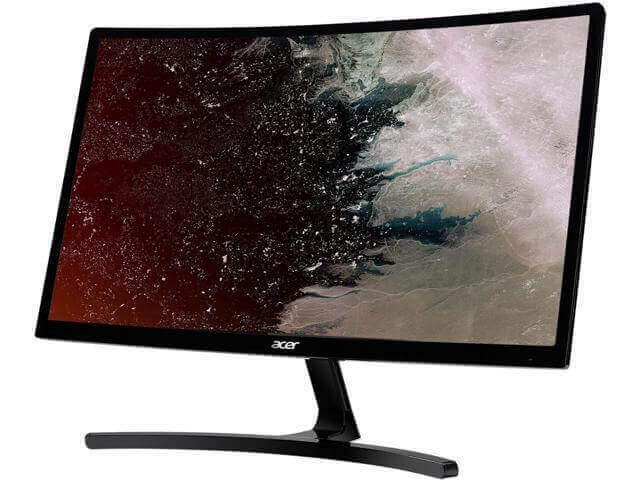 The review of the Acer ED242QR Abidpx monitor is given based on some of the significant aspects of the monitor. These factors play an essential role in enhancing the gaming experiences of users. The first thing that comes in our minds while purchasing any product is the price. We always prefer investing in products that do justice to the price. No one likes to invest his or her hard earned money in unworthy products. We always look for value in return for our money. The Acer ED242QR Abidpx monitor is equipped with high specs and available at a reasonable price. Moreover, the features of the product highly justify its price. Click here to check out its price. The look of the Acer ED242QR monitor is a complete eye-catcher. This gaming monitor has a beautifully designed 23.6” matte finished body. It looks elegant with its sleek and thin body. Also, Acer has not compromised with its build quality though it is available at a low price. The build quality is not bad. Overall, the look feels robust. The better the image quality, the superior is the gaming experience. Acer ED242QR Abidpx monitor possesses the best image and display quality. The product comes with a VA panel, which provides both vertical and horizontal viewing angles of 178 degrees. It offers a response time of 4ms, which is convincingly fast. The contrast ratio of 3000:1 is quite impressive. The wide viewing angle is an important feature. It helps in viewing images from different angles without any shift in contrast. One can view images in perfect contrast from any angle. The broader view feature of the Acer ED242QR monitor gives it a competitive edge over its competitors. The peak brightness is of 250-nits and supports 8-bit color composition. The image quality is superb for supporting 1080p gaming. However, the HD resolution results in low pixel density. Hence, it is not much preferable for reading and regular work. It might be a turn off for those users who are involved in intense writing and reading. But, this will not hamper your gaming needs. The Acer ED242QR Abidpx monitor is flicker-free. As per the claims of the manufacturer, the product does not possess any issue of dead pixels. However, many customers have reported about experiencing dead pixels issues in their reviews. The Acer ED242QR helps its users to engage in gaming for a long duration without giving any eyestrain. Most monitors have negative impacts on the eyes of gamers which could lead to severe consequences in the long run. But, the Acer ED242QR Abidpx monitor takes care of this need by providing the users with a stress-free experience. Performance is an essential factor to be considered before buying any technology product. With the advancement of technology at such a great pace, sticking to a low performing product could be very frustrating. When it comes to delivering great performance, the Acer ED242QR monitor does not lack behind. The refresh rate of the monitor is 144Hz, which helps in refreshing images at a super fast speed. Having a fast refresh rate is very crucial for console and FPS gamers to win over your opponents. Here is where this 23.6” display monitor really stands apart from other monitors within the same price range. The responsiveness time of 4ms helps in eliminating issues of ghosting to a great extent, reducing it to a very negligible amount. The great performance of the Acer ED242QR monitor helps gamers in winning over their rivals. The OSD (On-Screen Display) feature of the Acer ED242QR Abidpx monitor is simple and user-friendly. It offers normal controlling features of adjusting brightness, dynamic contrast ratio, color temperature, color settings, blue light filter, aspect ratio, contrast, input source selection, and overdrive. It is easy to operate via the joystick. The gamers can manage these screen features without facing any interruptions in there gaming. The Acer ED242QR Abidpx also provides with it the Black Boost feature which helps in increasing visibility while playing darker video games by increasing its brightness wherever required. Connectivity is an essential factor for gaming monitors. Gamers need to connect to a lot of devices at the same time. The Acer ED242QR Abidpx monitor provides a good option of good connectivity with an HDMI 1.4 port, a 1.2 Display Port, and a DVI port. One of the most disappointing features of the Acer ED242QR Abidpx is that it does not come with inbuilt speakers. It can be a major turn off for those gamers who like to have a loud sound experience during gaming. Most of the other monitors within the same price range possess great quality speakers. 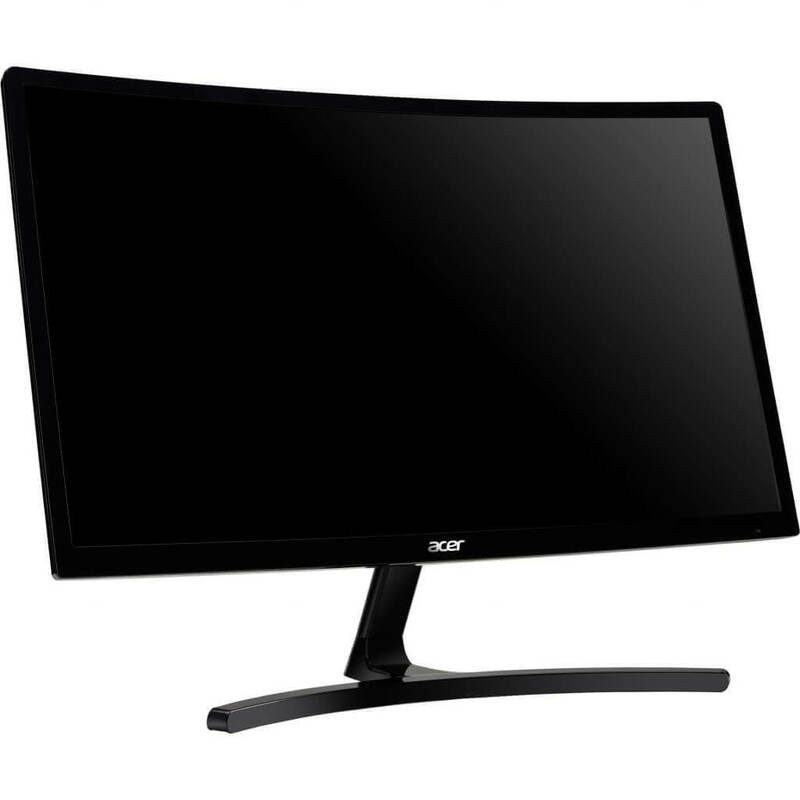 It is one area where the Acer ED242QR Abidpx monitor lags behind its competitors. However, it has an audio output jack for inserting headphones. You can tune into your headphones and secondary speakers to enjoy the sound effects. The Acer ED242QR monitor provides the AMD FreeSync technology with it. This technology helps in synchronization of the monitor’s refresh rate with GPU’s frame rate. With the help of this synchronization, the users receive a dynamic refresh rate. The dynamic refresh rate helps in eliminating stuttering and screen tearing issues. The AMD FreeSync technology also reduces the input lag thus enhancing its performance. It runs on the Windows 10 operating system (64bit). It has two sets of drivers of version 1.0, which can be downloaded from the official website of Acer. Upgrading to Windows 10 will automatically upgrade the drivers; otherwise, they can be downloaded by running windows update. The Acer ED242QR Abidpx monitor is a value for money purchase. The superb specs of this monitor aptly justify its price. The price of this monitor is comparatively less than its rival products. 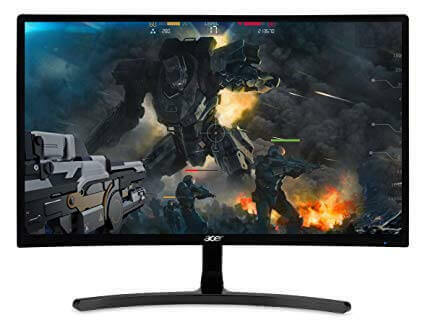 So, if you are searching for an affordable curved gaming monitor with commendable performance and vibrant picture quality, the Acer ED242QR Abidpx monitor could be the perfect pick.